You just wait until I hook up the outboard on the Electro-Metro!!!! When parked, I'll flip it up into the air and use it as a wind generator for recharging!!! Wait, if it's half boat, half car, does that make it a hybrid? Ben: mine can also be a turbine with the sail. I'll just mount the car by one of its front hubs. OK, never mind. Energy economy is creeping back up to normal. Last charge cycle was 330 Wh/mi. Still a bit worse than average. 1/3 of that was trailer towing (put the little boat away for the season). The remainder was driving moderately efficiently in regular traffic -- which restricts how much coasting down to stops I will do. If I can't coast to stops, regen would be the next best thing instead of heating up the friction brakes. This is a very inspiring and awesome EV build. I wish I had the money and a manual transmission to do an EV conversion on my Focus. Thanks, Angmaar! You can do a conversion on an automatic transmission. It's just slightly more complicated, and ~5-10% less efficient. Many have been done. Good news: I've heard through the local EV pipeline that another pack of used batteries may be coming available next month. The current pack (also 2nd hand) - the Hallowe'en pack of 2008, as I like to call it - is still relatively healthy (for ForkenSwift purposes), but its range has dropped in the 2 years it's been in the car. When it was installed, I managed to squeeze 40 km (25 mi.) from it without much difficulty. But last Sunday, I had to really baby the accelerator to make a 30 km (20 mi.) round trip. The most directly comparable other drive from one year ago got me 37 km in similar conditions. 30 km is still fine for around here. Heck, 20 km is fine - the pack would probably be good for another 2-3 years based on the rate that range has changed in the last 2. Darin, do you have any good close-up photos of how you installed the hitch on the Forkenswift? I want to add one to the Electro-Metro. It has to be good and sturdy though, as it needs to be able to hold the weight of a generator. Hi Ben - The ForkenSwift has a different hitch style than the 1995+ car. Different underbody back there. Best bet is do a search on eBay - they have some photos of the hitch style for your year. New batteries for the ForkenSwift! Well, "new to the ForkenSwift" batteries. These are from the same car that provided our current pack (Hallowe'en 2009... We'll call these the Valentines 2011 pack). The ower of the Jetta that they came from is upgrading to a lithium pack. This lead was apparently good for at least 20 km range in winter conditions (insulated/heated battery boxes in that car however). Not good enough for them, but fine for the ForkenSwift's small town use. Price: "core" rate of $15 per. 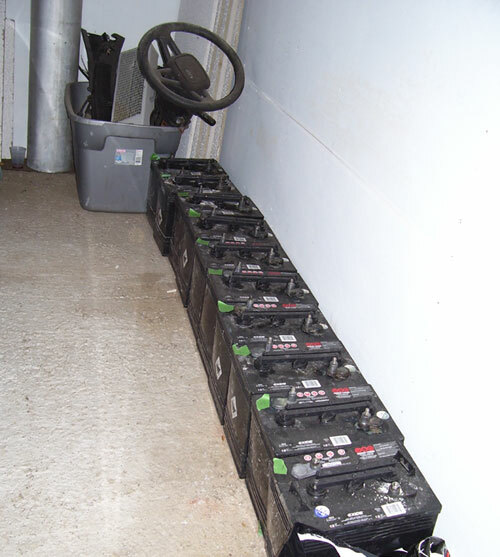 Nothing says "I love you" quite like a big old pile of lead acid batteries! It is enough to swoon.